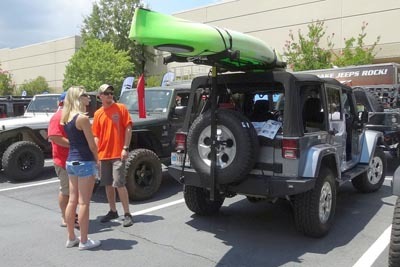 Barry Ogletree brought Fred the Stretched 3B from Texas for the show, and took some photos for us. 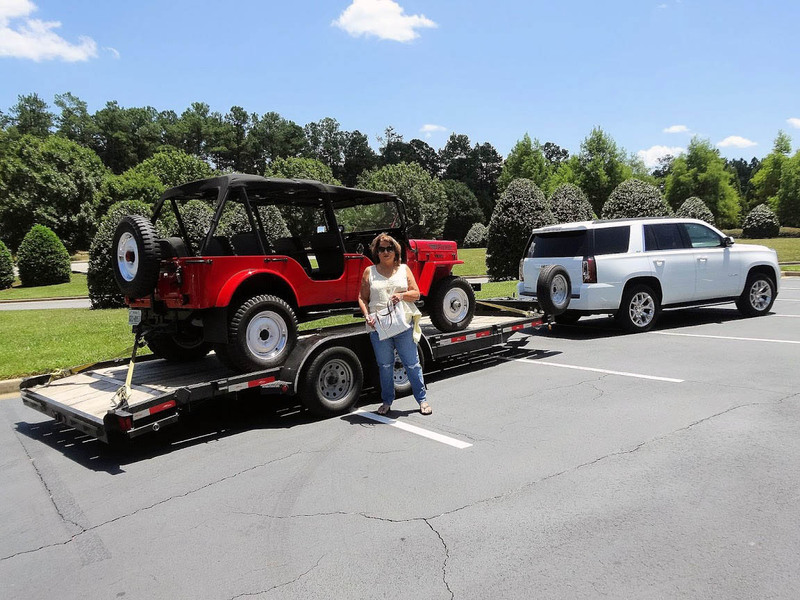 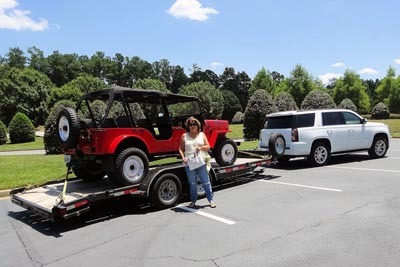 Barry and Karen arrived with Fred on the trailer on Friday afternoon, and found a couple of Jeeps from the collection flanking the entrance to the building. 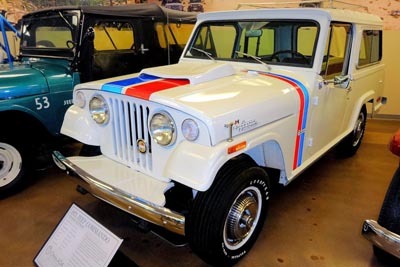 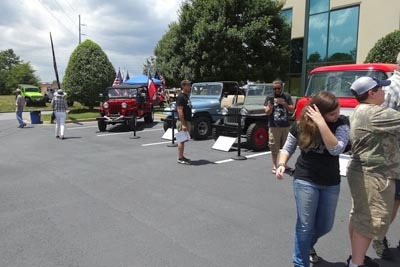 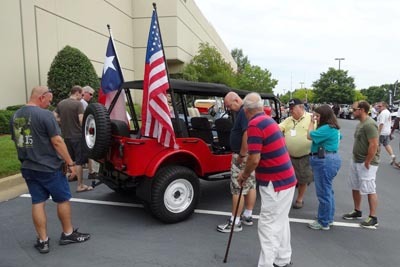 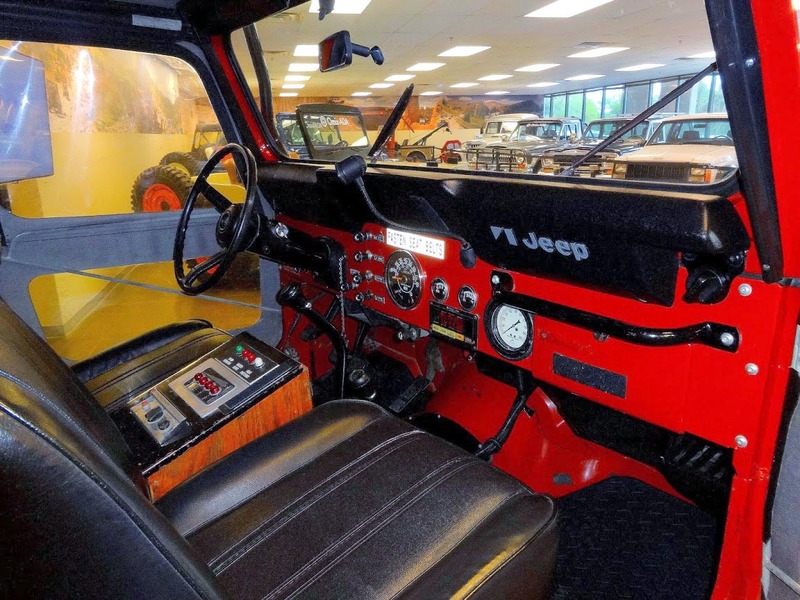 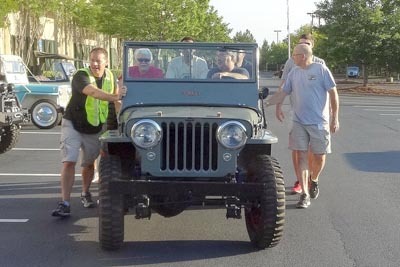 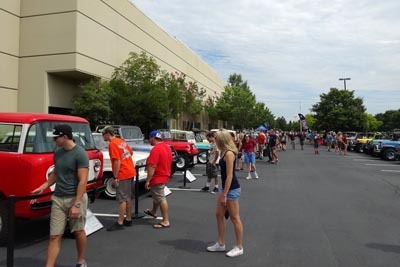 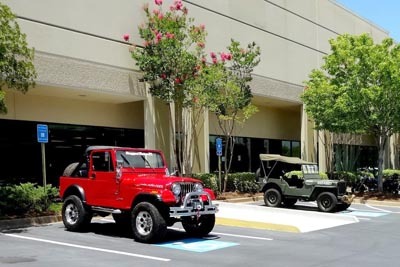 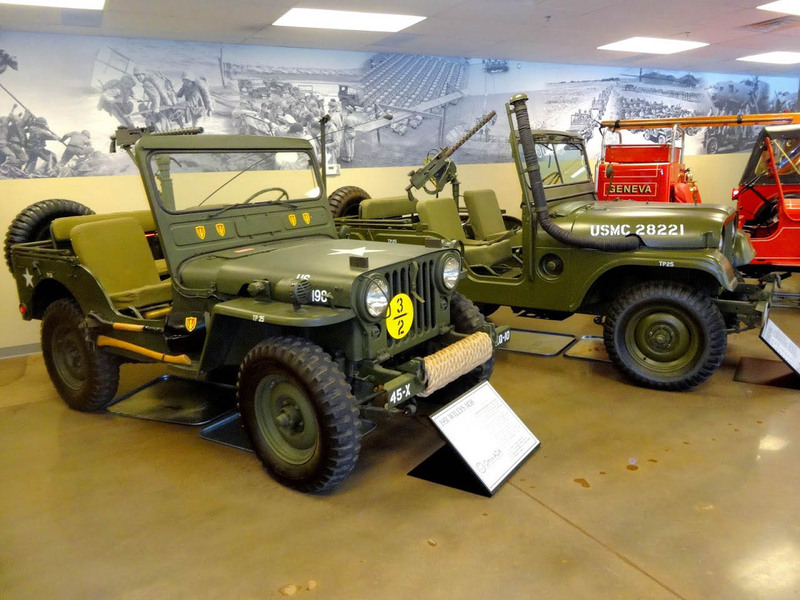 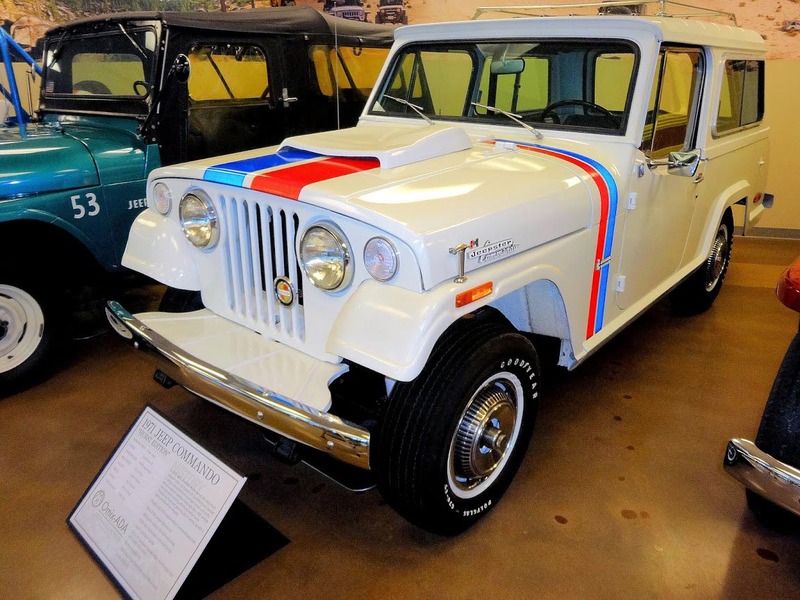 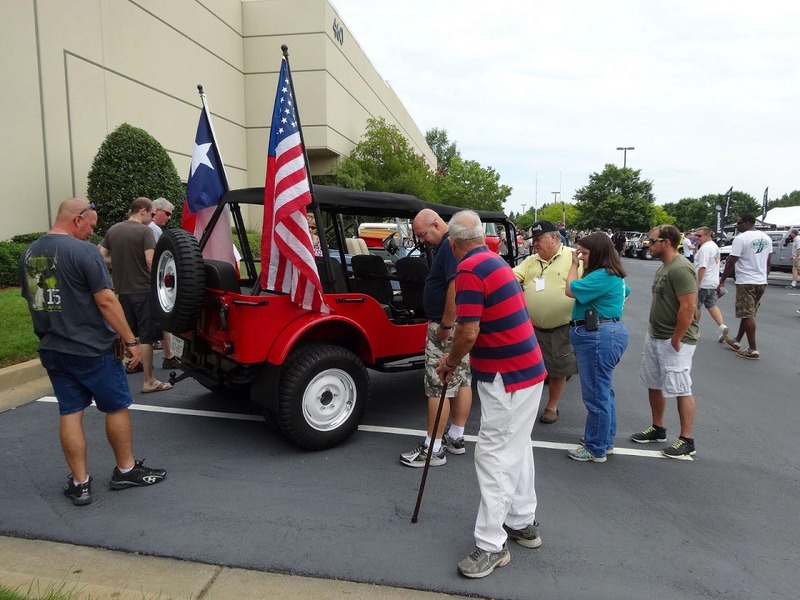 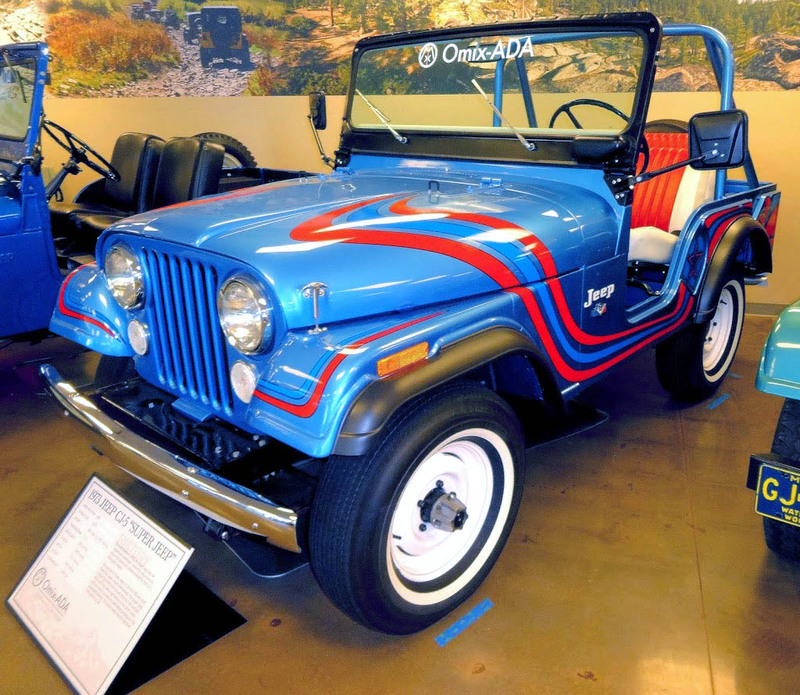 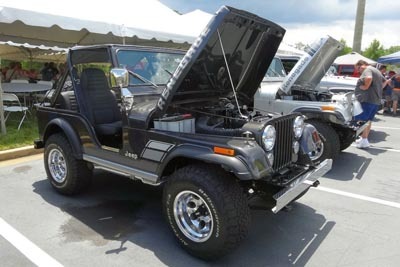 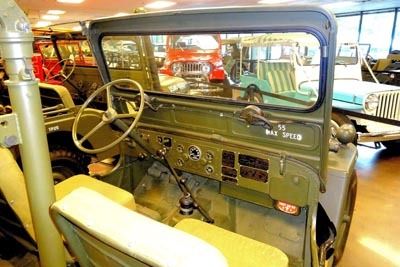 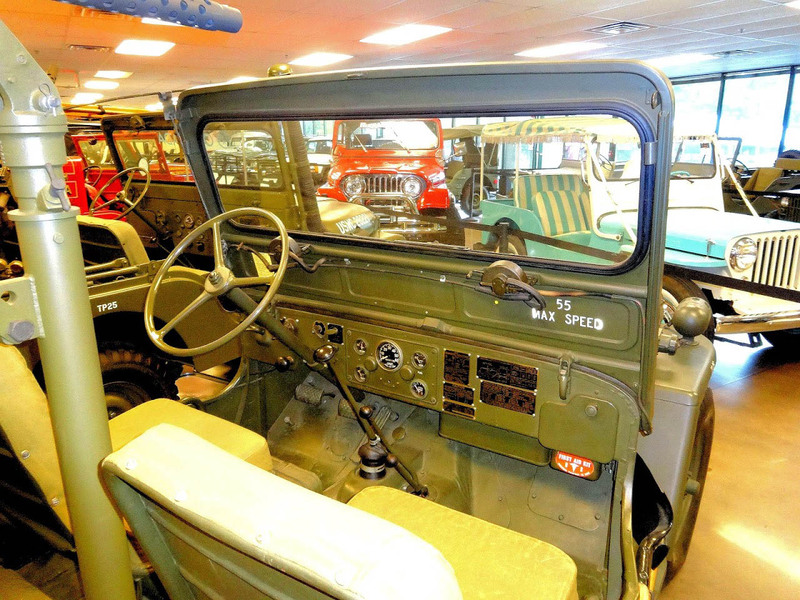 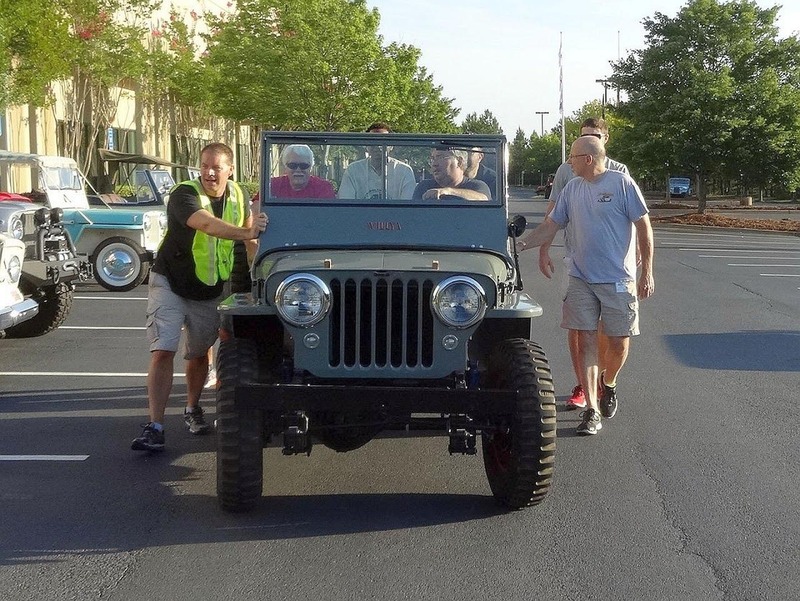 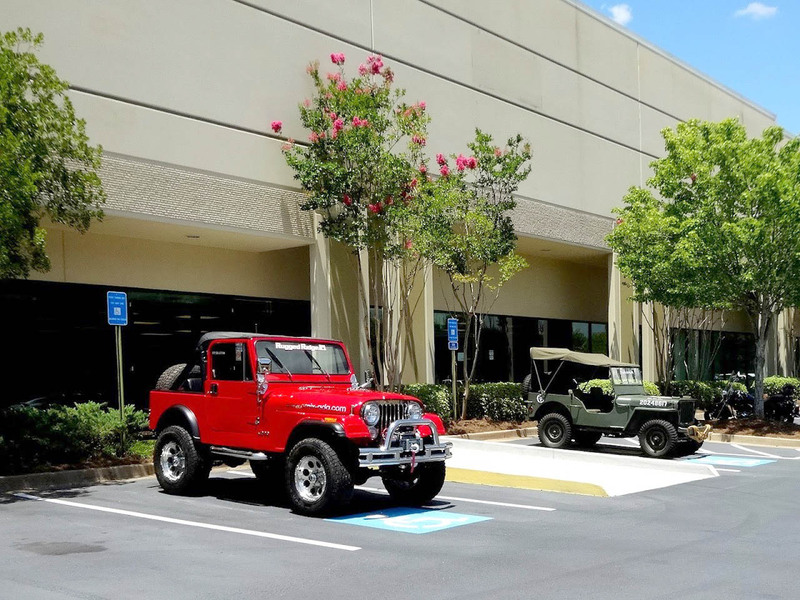 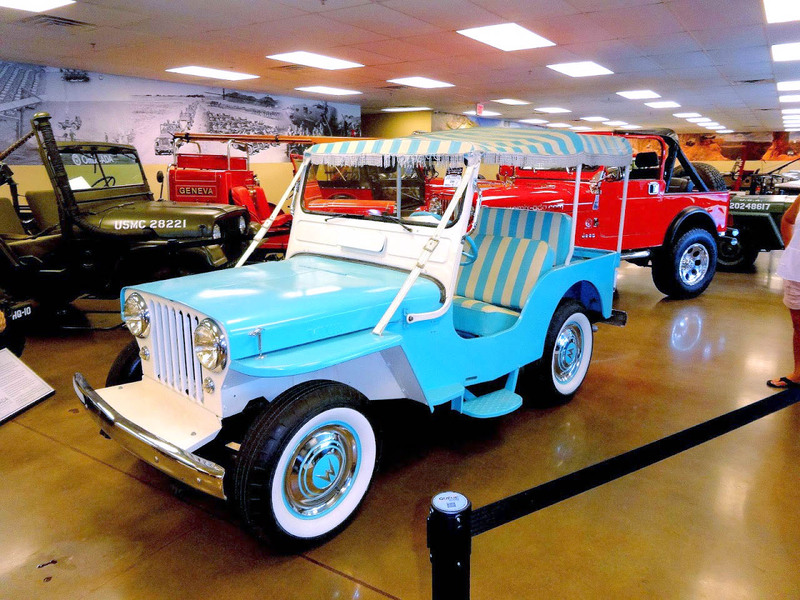 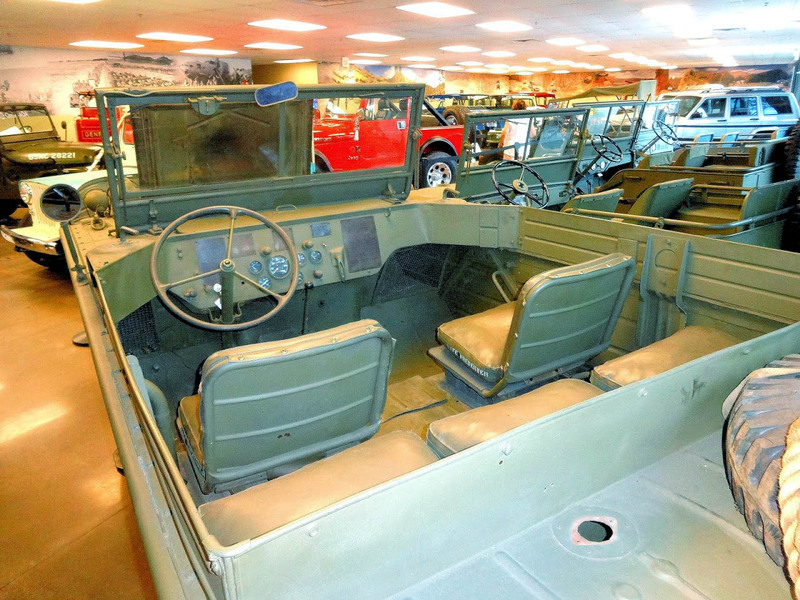 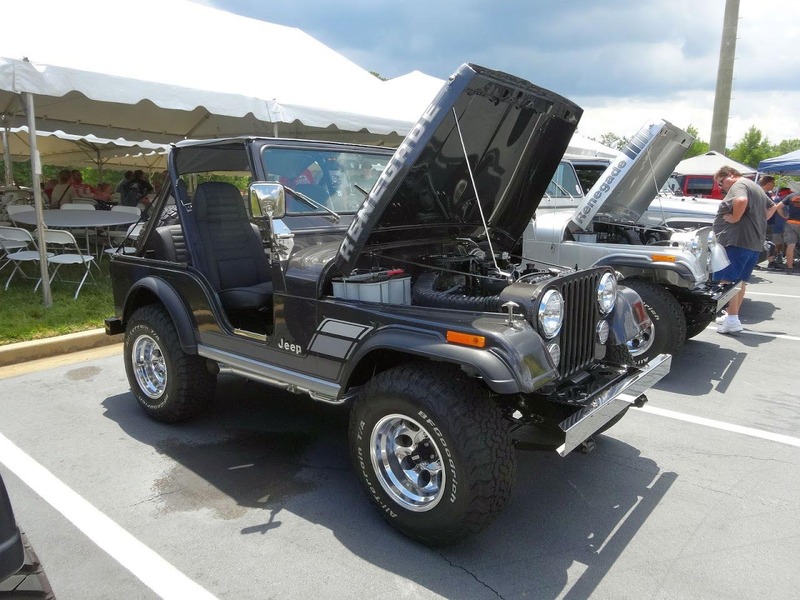 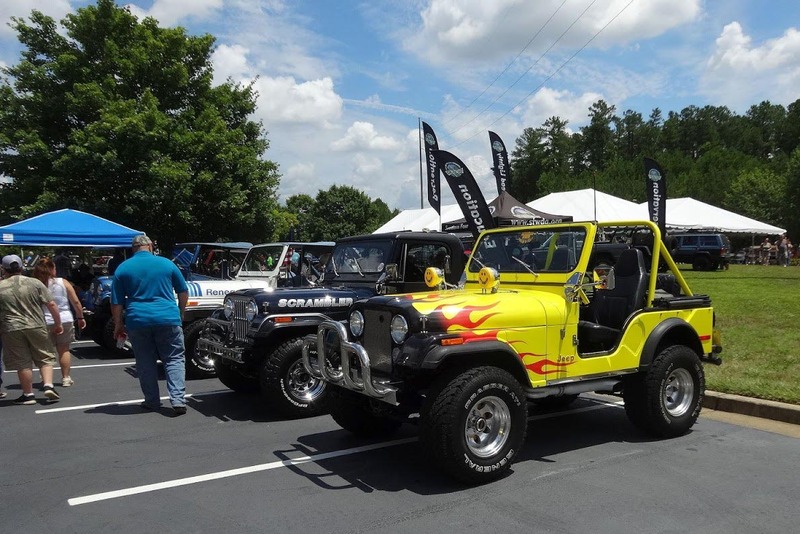 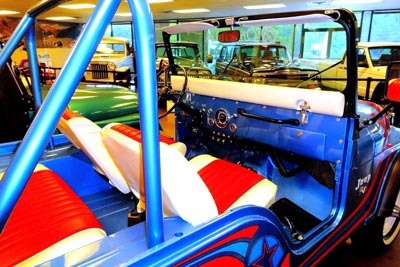 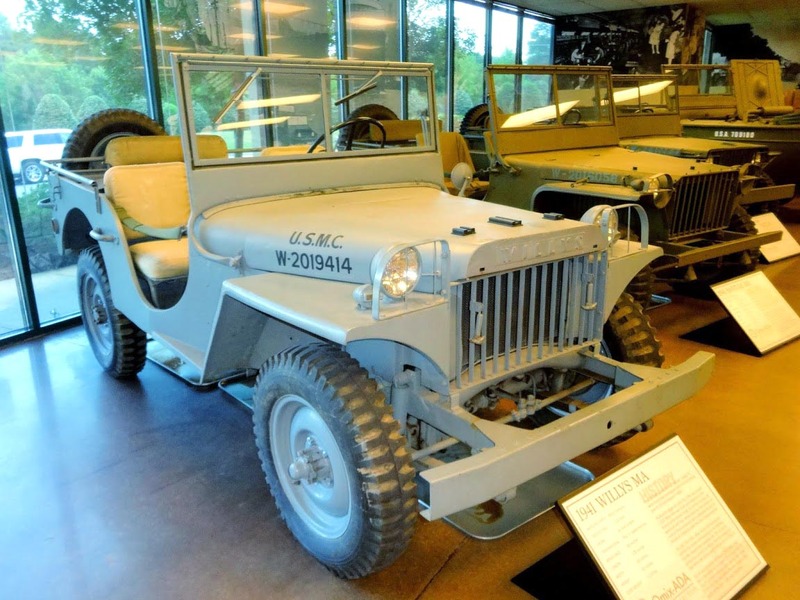 To date, the Jeep Collection has purchased over 30 original or restored Jeep vehicles, under the direction of Omix-ADA founder and president Al Azadi, and Jeep Collection curator Dave Logan. 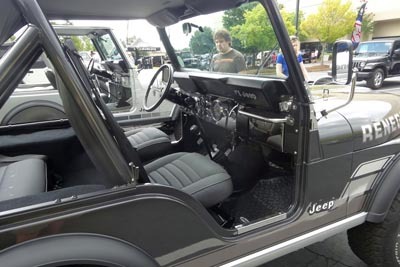 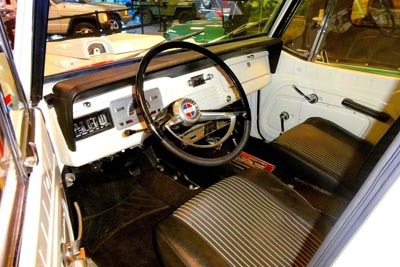 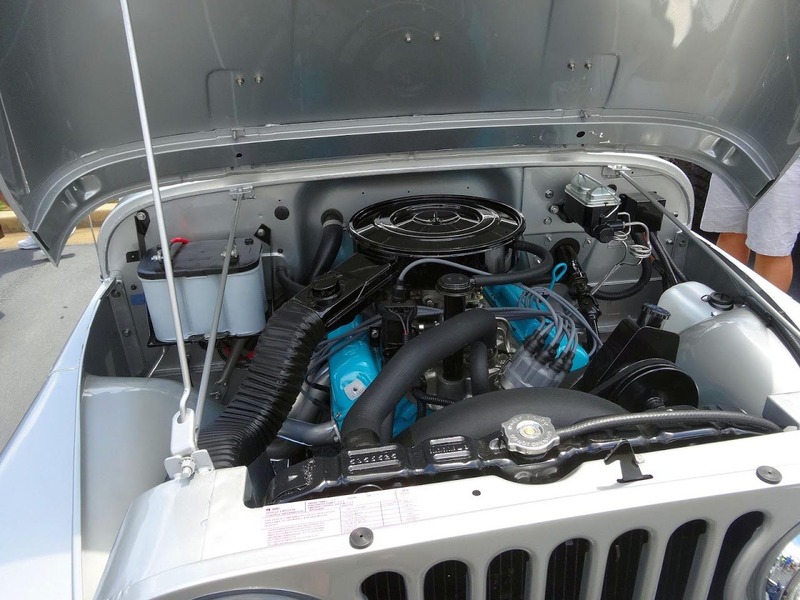 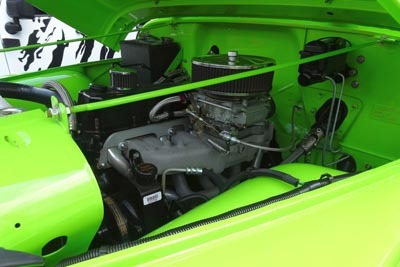 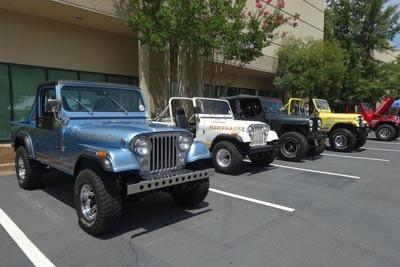 The aim is to preserve significant Jeeps, and to have them accessible to the company to assist in the continued development of replacement parts. 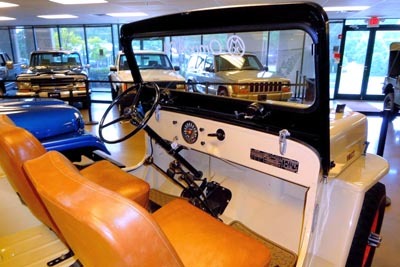 Inside the front door, Barry immediately saw the 1964 Willys CJ-3B, sitting next to a blue CJ-5 nine years older. 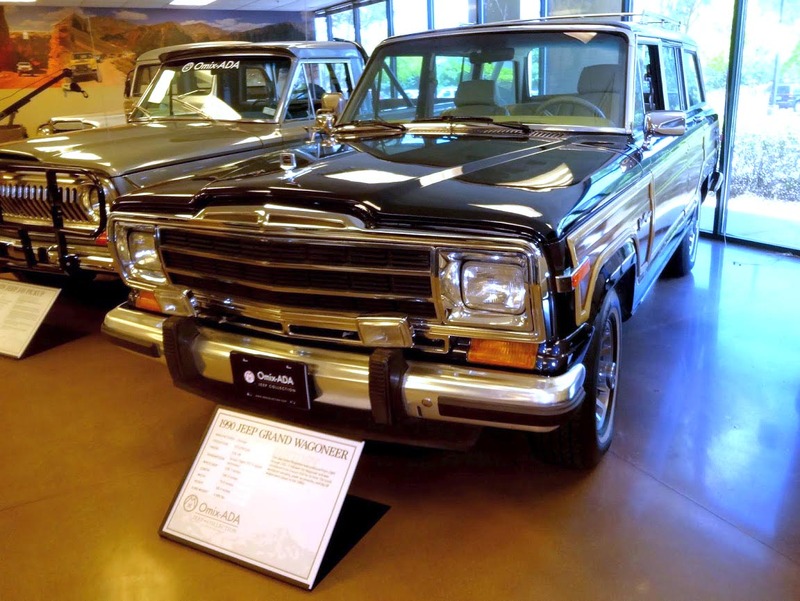 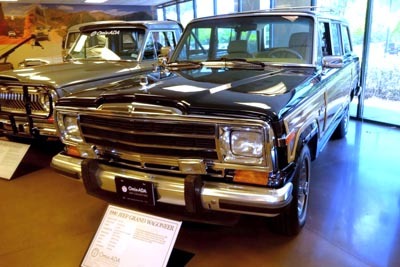 But it was clear that more recent models were not overlooked, as across from the 3B were a Grand Wagoneer, XJ Cherokee, and J-10 and Comanche pickups. 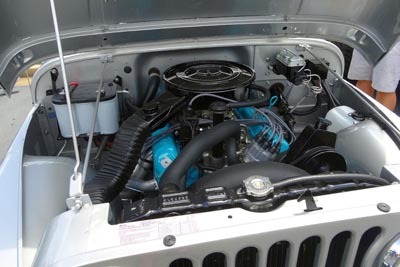 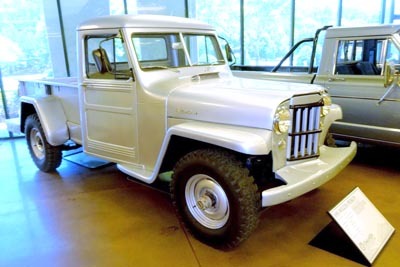 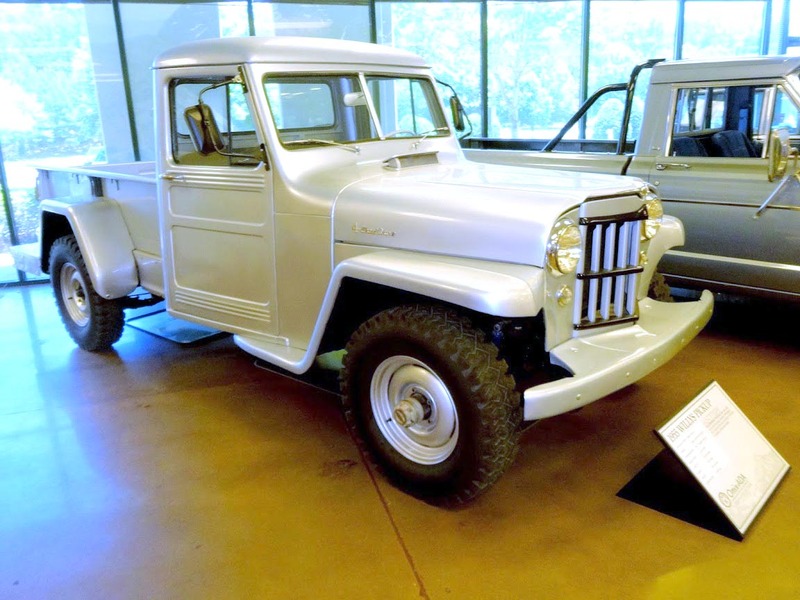 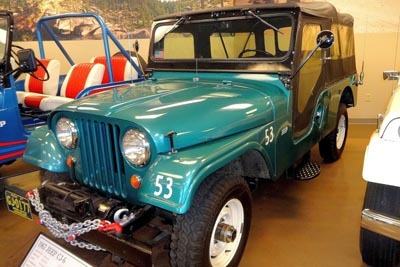 Rare packages in the collection, such as the Hurst Commando or the CJ-5 Super Jeep, are joined by representatives of standard models, such as the 1955 pickup and 1947 station wagon. 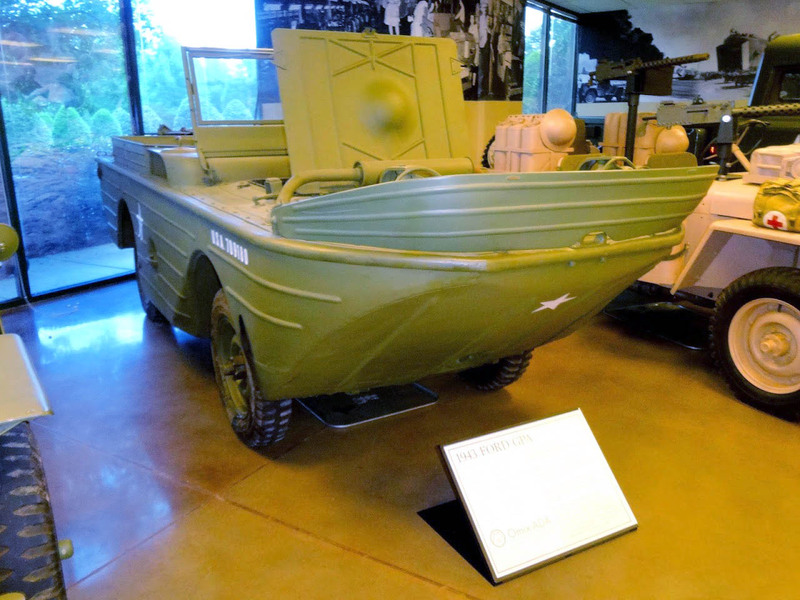 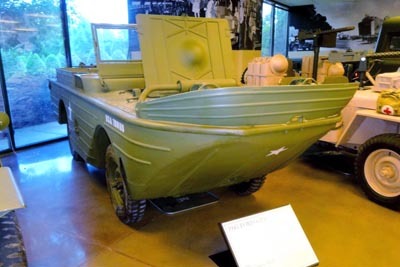 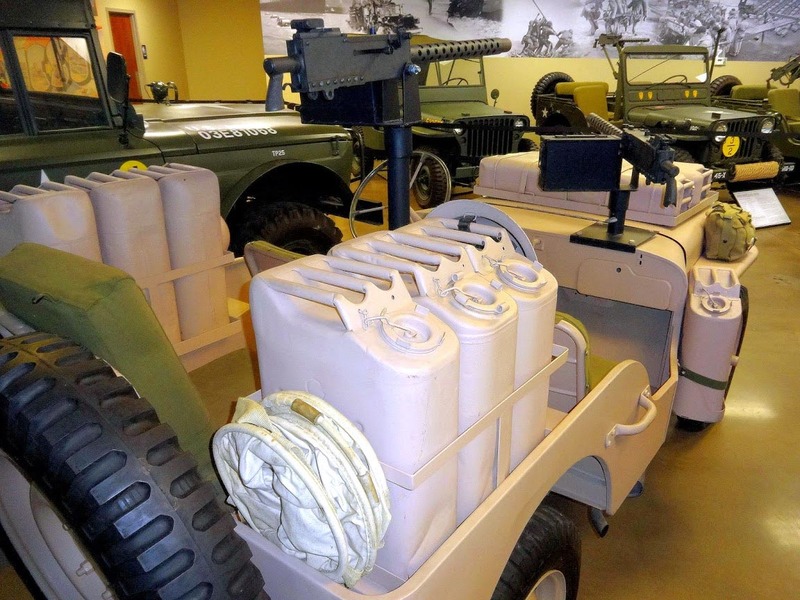 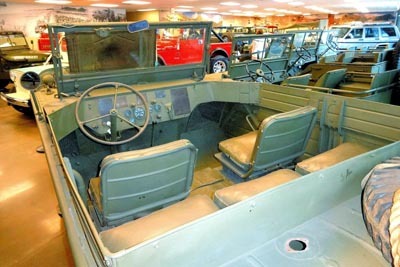 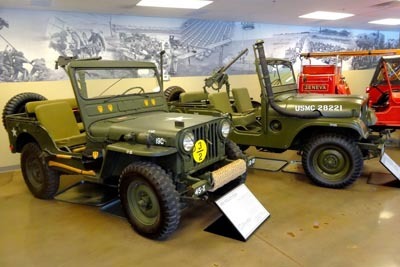 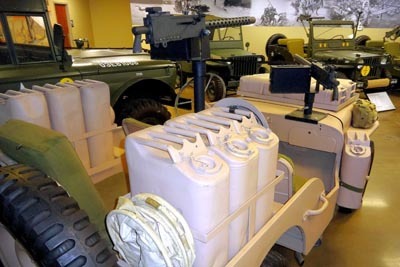 In the military section are the M38 and M38A1, plus World War II models including all three 1941 prototypes from Bantam, Willys and Ford. 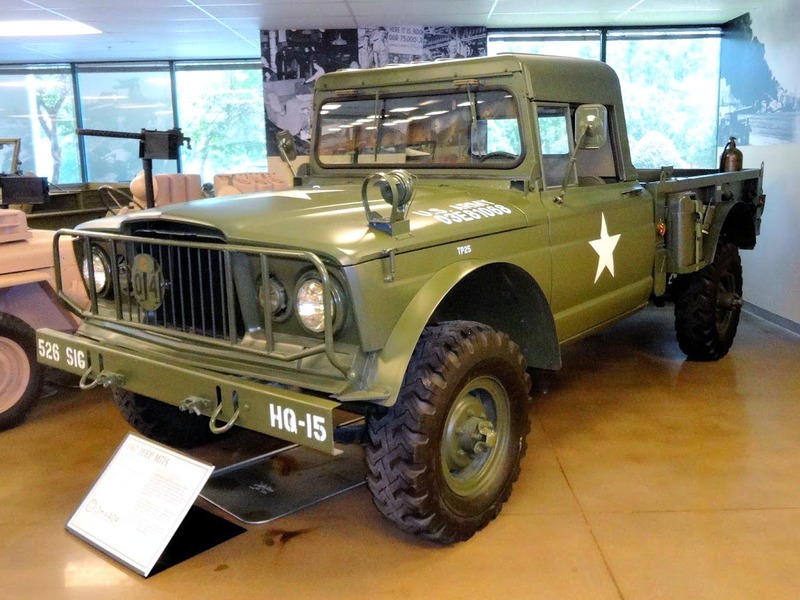 Other Fords include a clone of a Special Air Service jeep, and a GPA "seep". 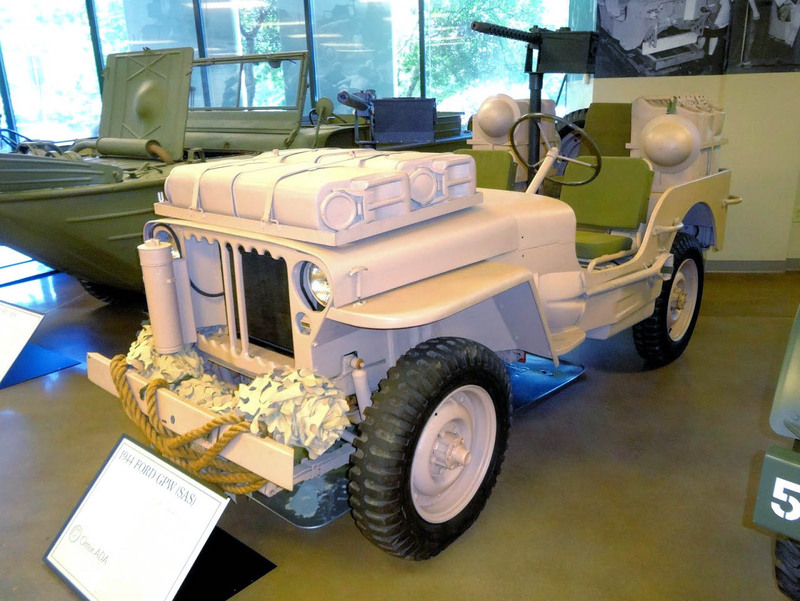 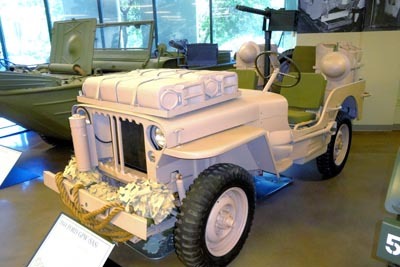 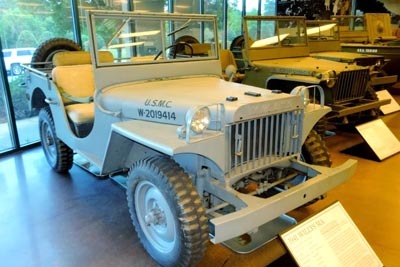 The Willys MA is the rarest of the 1941 prototypes, and the collection's example is lettered for the Marines. 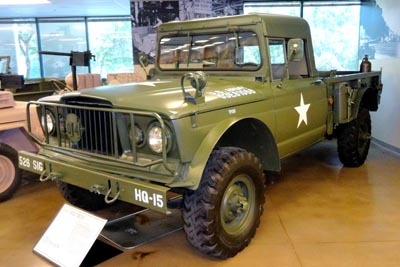 And the last Jeep built for the U.S. military is the M715 1-1/4 ton truck. 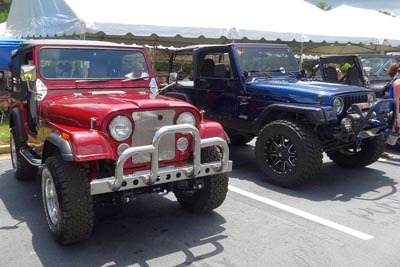 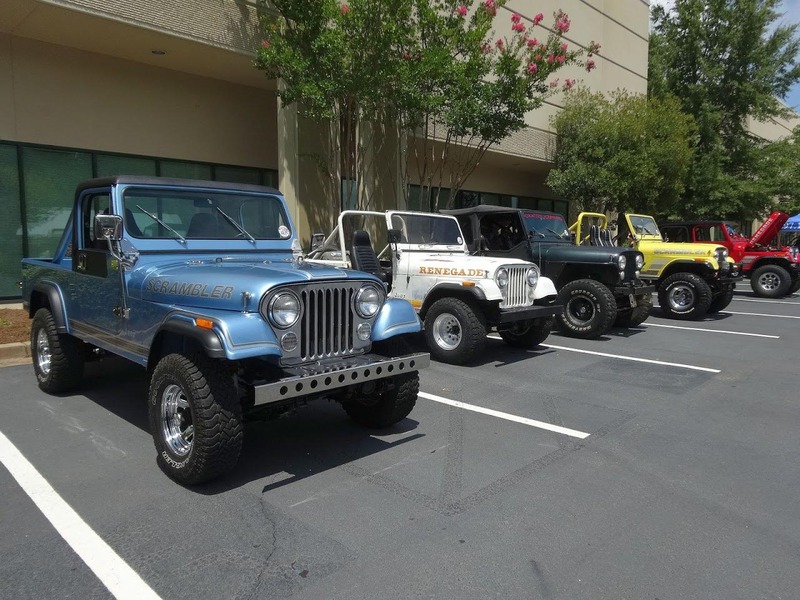 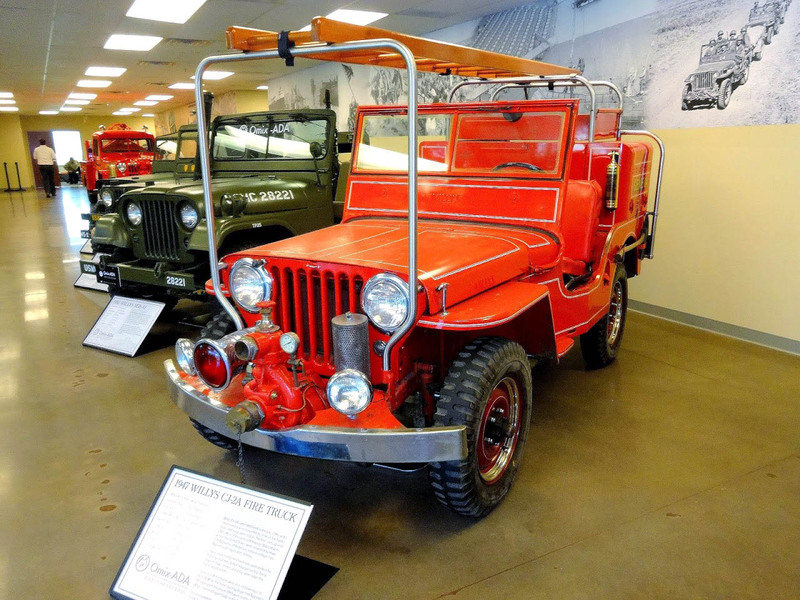 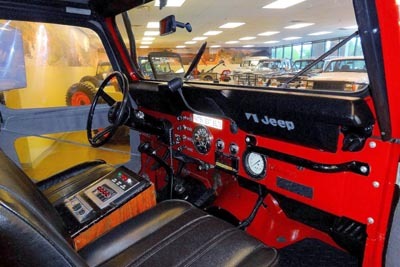 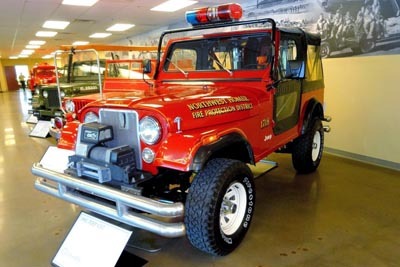 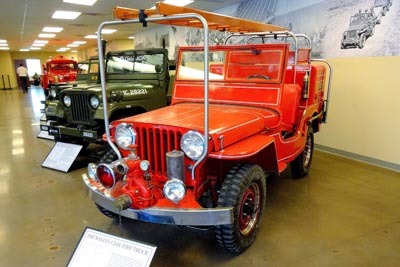 Fire service Jeeps in the Jeep Collection include a 1982 CJ-7, and a 1947 Boyer CJ-2A which formerly belonged to Mark A. Smith, founder of Jeep Jamboree USA. 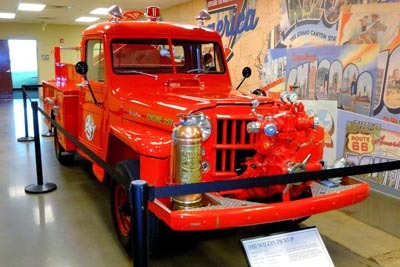 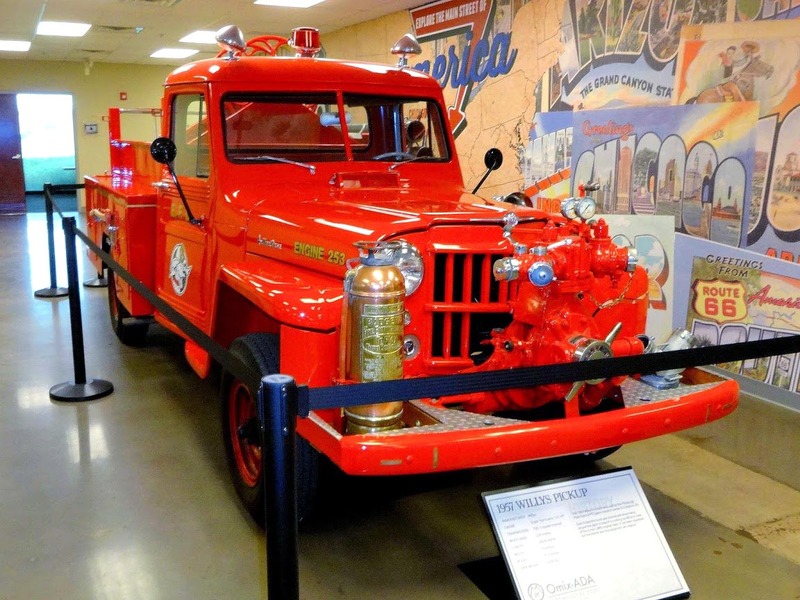 The newest acquisition is a 1957 Valley Fire Truck conversion. 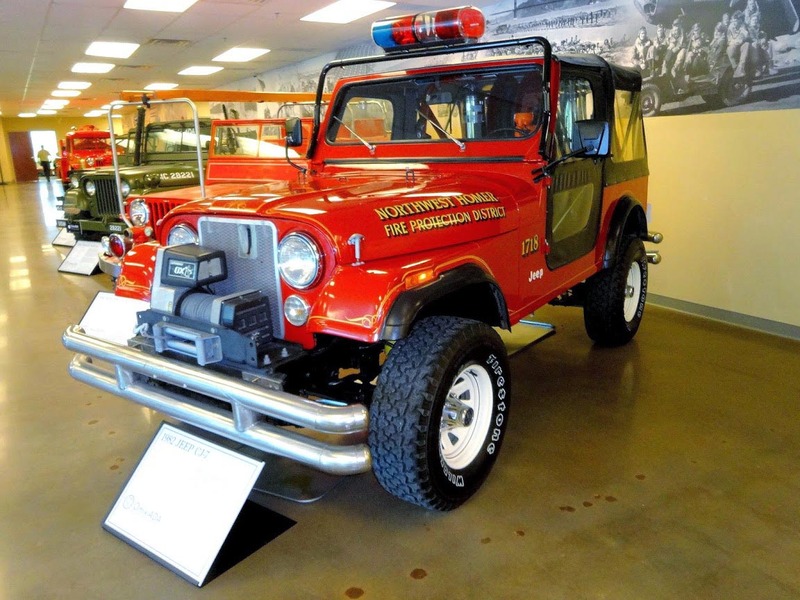 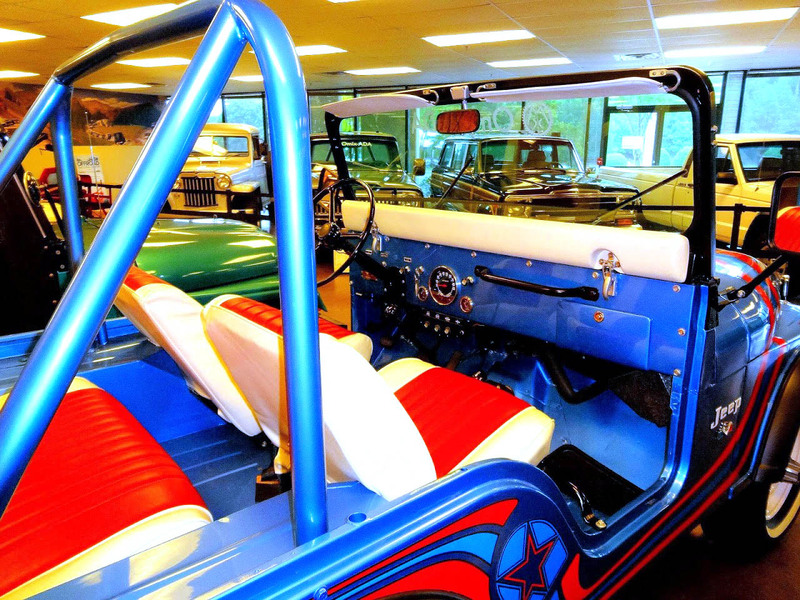 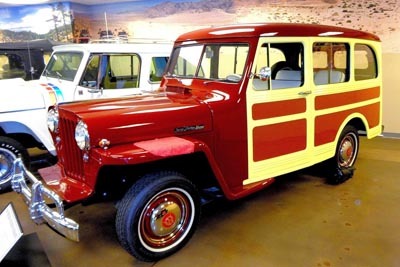 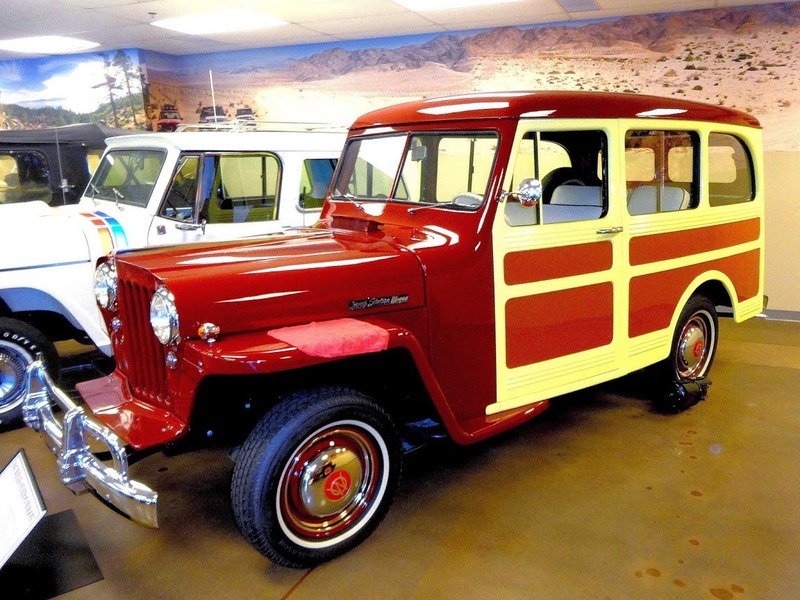 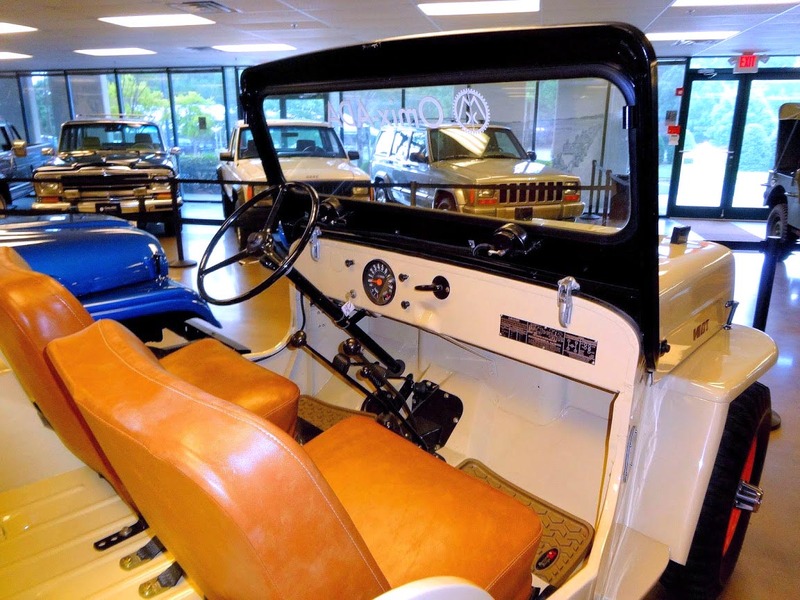 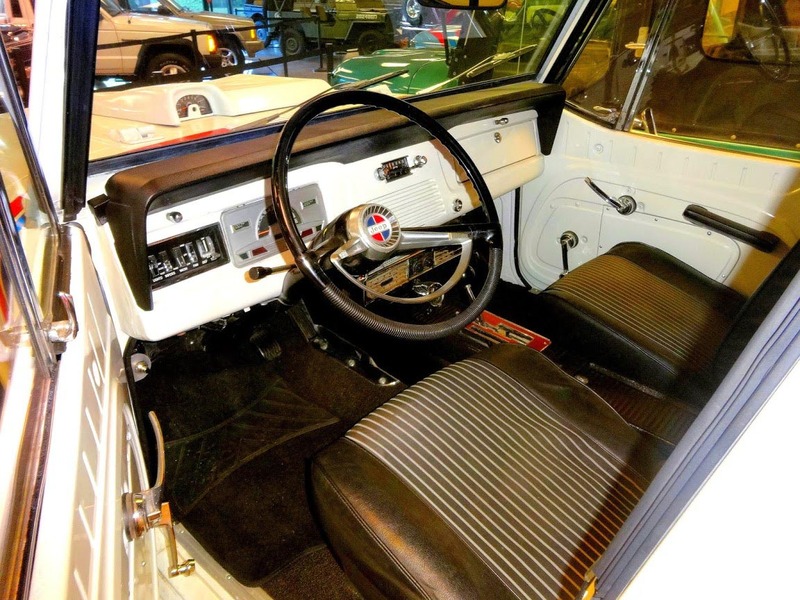 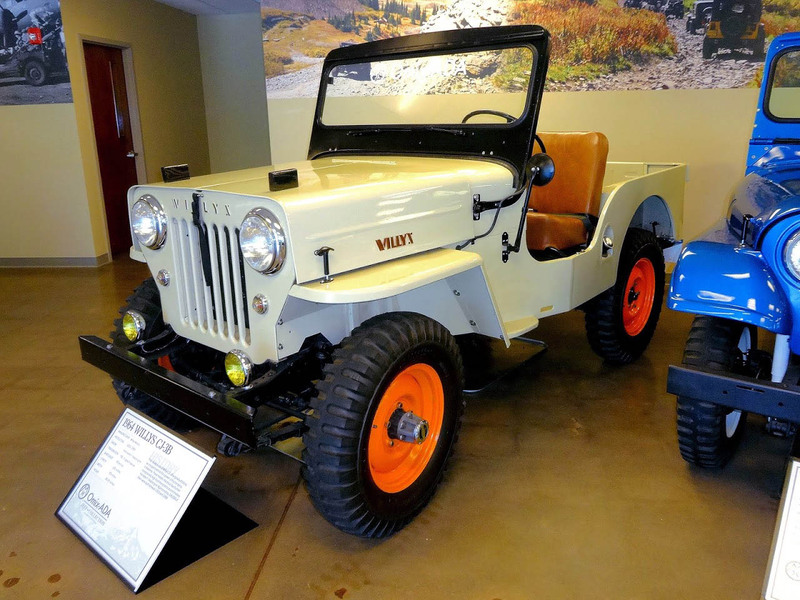 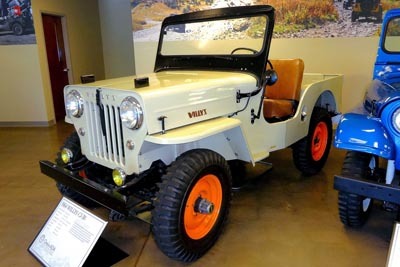 The beautiful low-mileage CJ-6 in the collection was purchased new in 1967 by funeral director Bill Price in Michigan, and actually served in his fleet as an off-road ambulance. 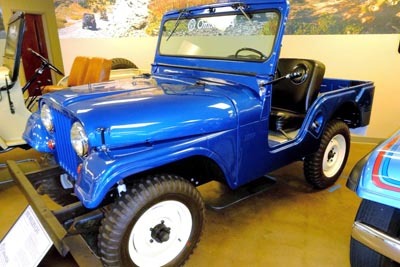 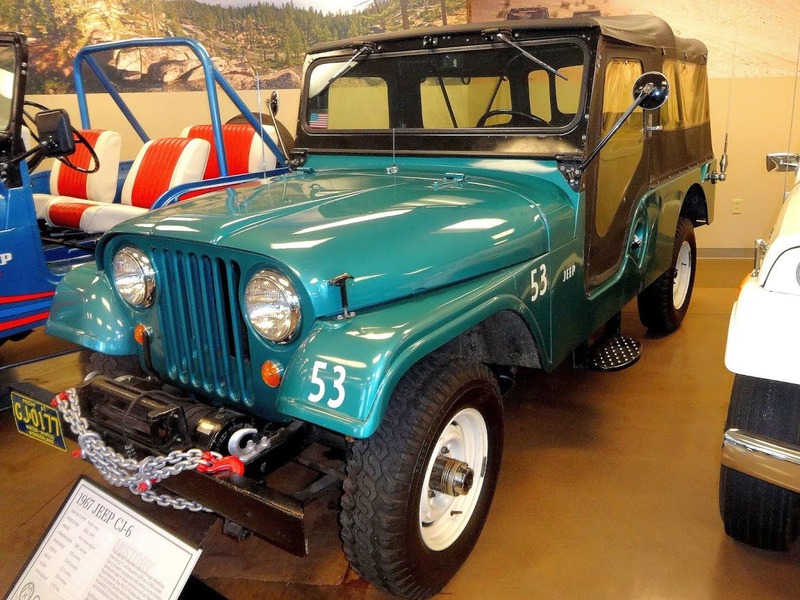 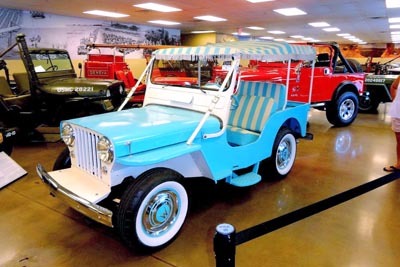 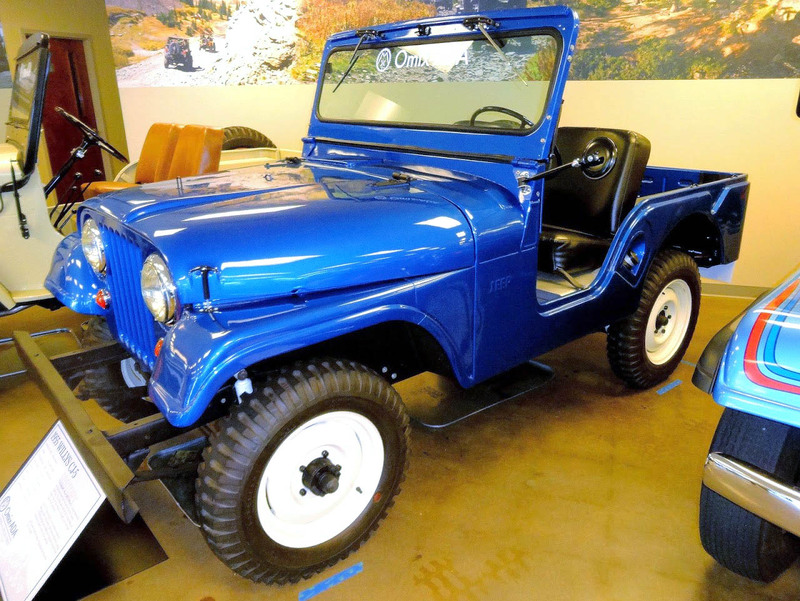 Another beauty is the Cerulean Blue DJ-3A Surrey, formerly part of Jim Marski's Historic Civilian Jeeps Collection in Colorado. 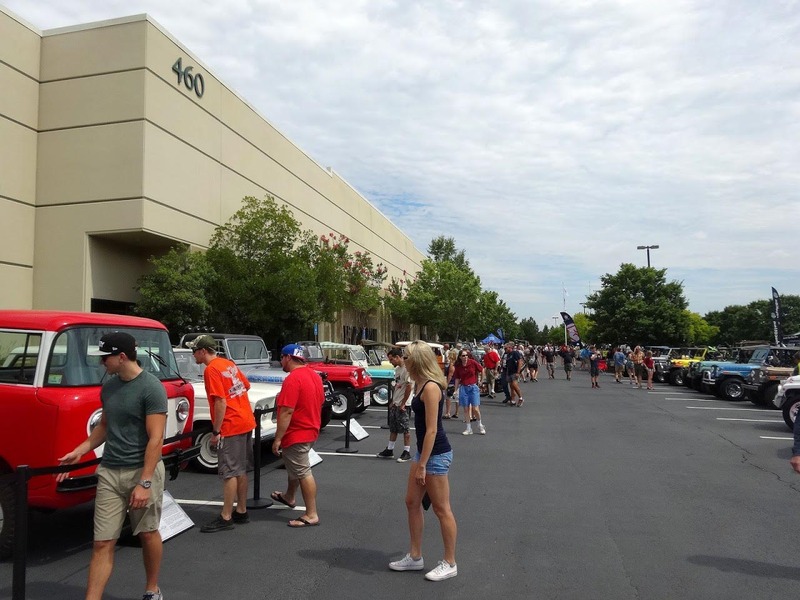 Saturday morning a few volunteers helped Dave Logan line up some of the collection out front for the show & shine. 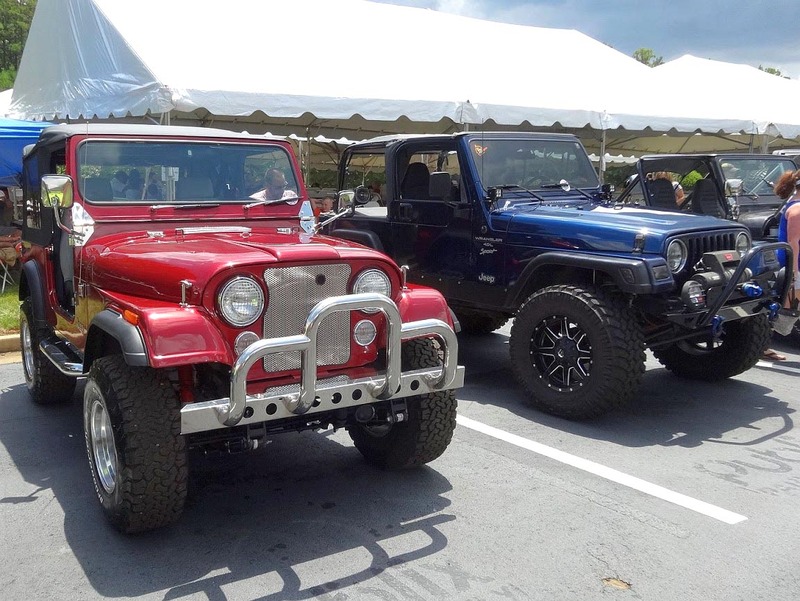 Fred the stretched 3B was in a prime spot right beside the collection's 1964 CJ-5. 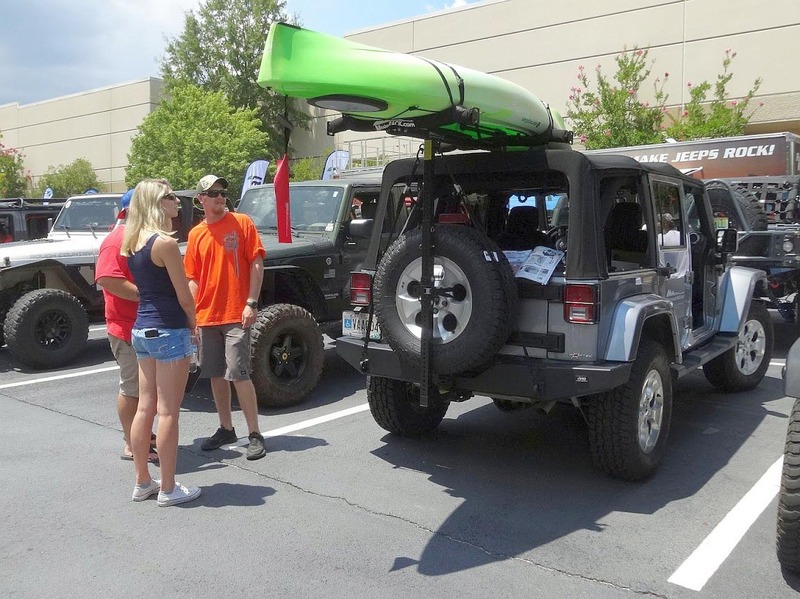 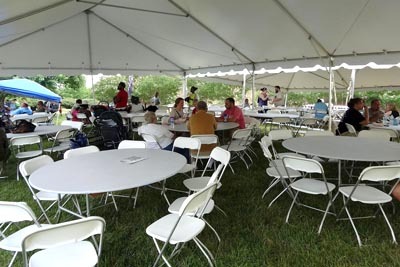 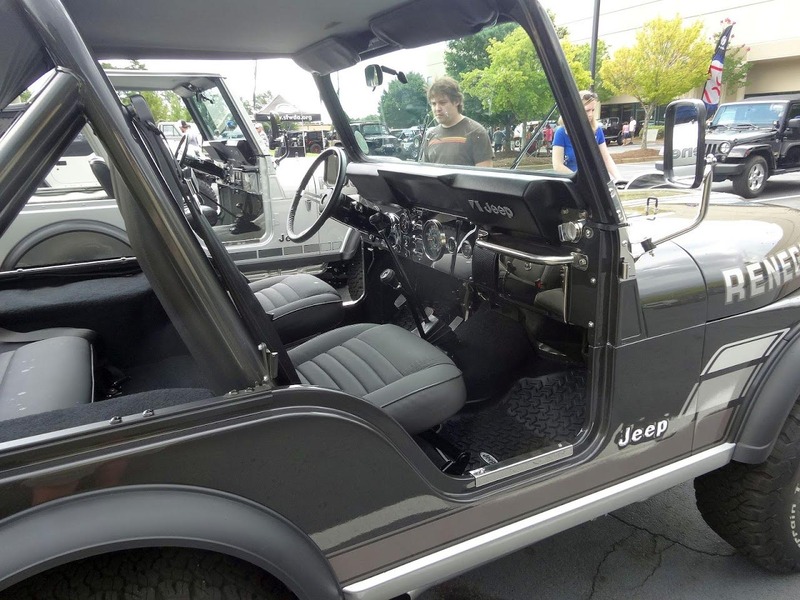 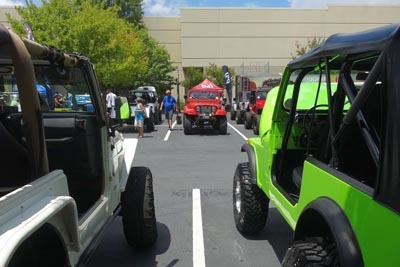 People had a great time at the well-planned show, which also featured gourmet food trucks, a huge dining tent, and a Jeep playground for the kids. 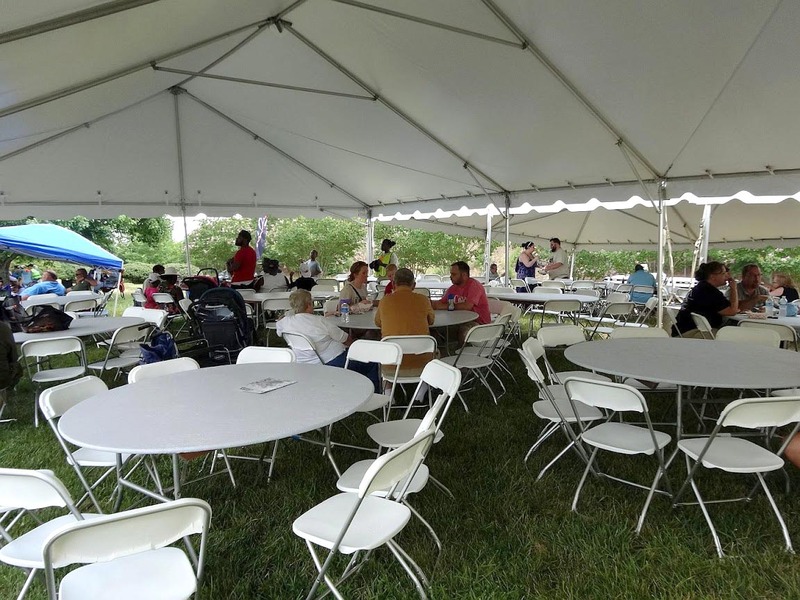 The enthusiasm and helpfulness of the Omix-ADA employees who volunteered to assist, really contributed to the success of the large event. 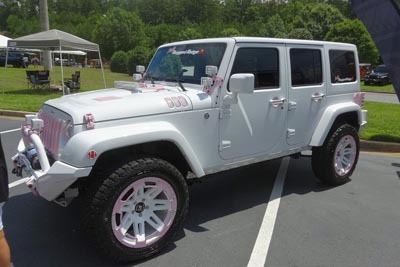 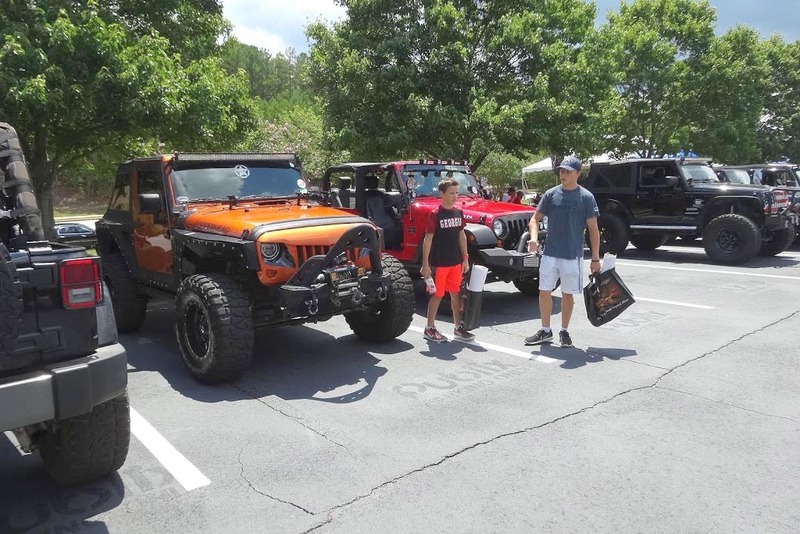 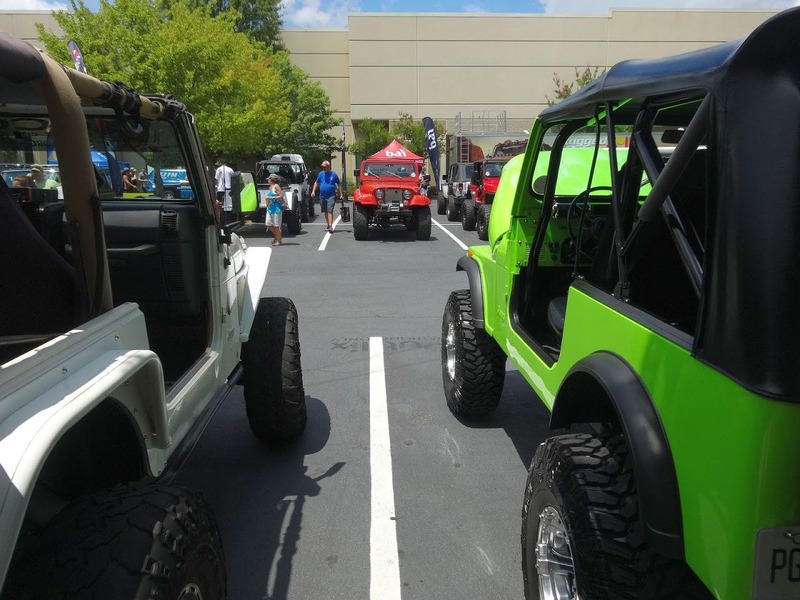 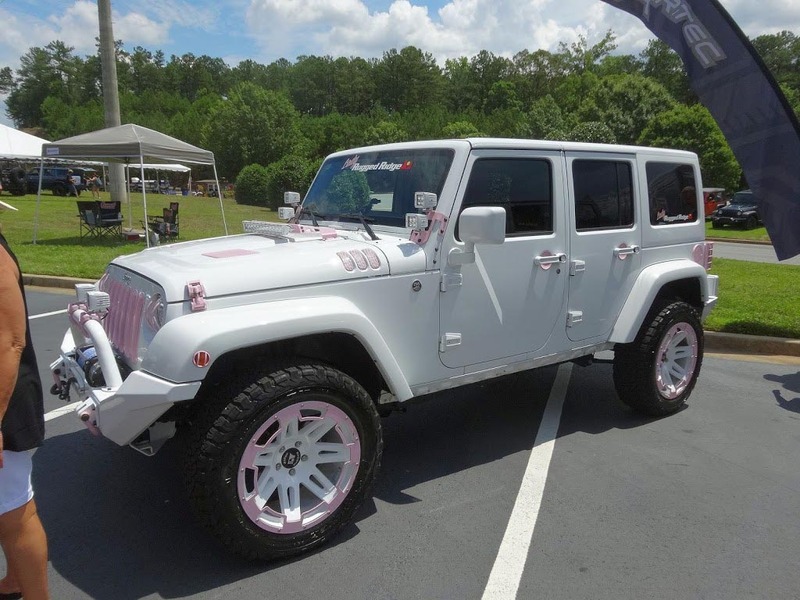 In addition to over 200 Jeeps entered in the show, there was a parking lot filled with hundreds of Jeeps. 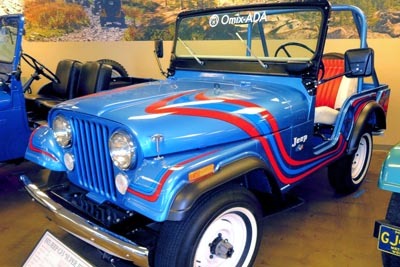 Thanks to Omix-ADA for creating the Jeep Collection and sponsoring the Expo. 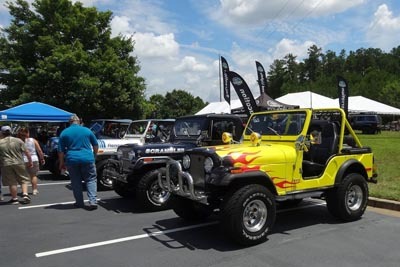 Dave Logan confirmed that they will be doing it again in 2017.